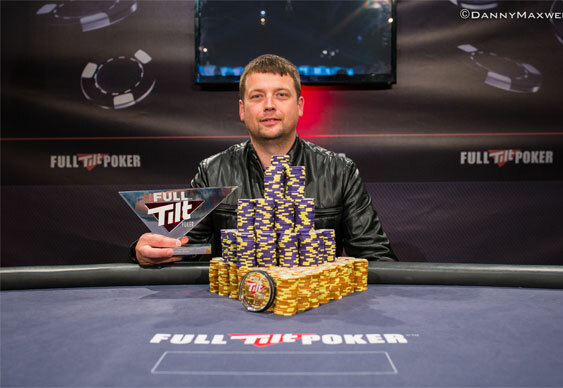 He started yesterday’s finale with the chip lead and within four hours Alan Gold had parlayed that dominance into a UKIPT title and €187,494. Carving his way through the final seven players in almost record time left Gold with enough time to cut a deal with second place Paul Febers before going on to scoop he trophy and his first major title. The final session started with Jonathan Slater hitting a patch of bad luck when his pocket sevens were only second best against Dimitri Pembroke’s pocket queens on a Qs Th 7d flop. With no help from the dealer on the turn or river the pot was pushed towards Pembroke and Slater was sent to the rail after just 30 minutes. Another two eliminations soon followed as Christy Morgan and Benjamin Spragg both committed the last of their chips with dominated aces. With just five players left it was the turn of Gold to assert his dominance and after dispatching Damian Porebski in fifth a slice of luck helped him eliminate Pembroke. After watching his short-stacked opponent move all-in from under-the-gun, Gold made the call with Ac Td but found himself behind when Pembroke revealed Ad Kd. Fortunately the first card off the top of the deck was the Ts and as the rest of the board ran out: 9s 4s 4h Qc, Gold was able to scoop the pot and increase his chip lead. On the very next hand Gold was playing executioner once again when his pocket tens were able to hold on against Daragh Davey’s K-J. Now down to just two players a brief financial discussion took place and once the pair was satisfied with their prizes the action resumed in earnest. As had been the trend for the entire final table it took just a few minutes for Gold to take the title. After turning trips with Qh Jd on a Qd 6h 5s Qc board, Gold was able to seal the deal against Febers’ pocket nines when the Kd fell on the river. With that a final handshakes brought the match and this year’s UKIPT Galway festival to an end. The next stop on the UKIPT is another £250 buy-in series event at the Hippodrome Casino in London from 27-29 September. The UKIPT proper returns shortly after with the Connaught Rooms in London the venue for the £1,000+£100 buy-in, £500,000 guaranteed tournament from 2-6 October. Qualifiers are up and running at PokerStars where new players can earn a 100% first deposit of up to $400.